When it comes to online casinos, companies tend to fit into one of two categories. They’re either the casino arm of a larger enterprise – we’re talking about the likes of William Hill, Bet365 or Ladbrokes – or they are a company that’s seemingly come out of nowhere, springing up since the development of online gambling exploded to the point that it made financial sense for start-ups to take things to the next level. Energy Casino is the latter and proves that experience isn’t everything. Set up in 2013 and operated by Probe Investments Limited, Energy Casino is a company that has flipped things on its head. It’s one of the fastest growing online casinos in the business and their success has been such that in 2016 they decided to launch their own sportsbook. They offer a lively website with plenty of features and extras (they even have their own branded merchandise), an exceptional Live Casino and Slots enough to keep players up into the early hours. Energy Casino knows how to keep their customers happy. Register and deposit £10 or more and receive 100% matched bonus up to £150. Wager the bonus and deposited amount 25x in 30 days to turn to withdrawable cash. Some games excluded from wagering, see Energy terms for full details. Maximum £5 bet per hand/spin when wagering the bonus. The beauty of the world of online casinos is that the vast majority of them use external suppliers for their table games and slots. Consequently, you can join up with a casino you might not know much about personally but be guaranteed that the games they offer will be top-notch. When it comes to Energy Casino, they use a number of hugely well-respected software providers like NetEnt, Play N’Go, GreenTube (Novomatic) and Microgaming; with Evolution and Pragmatic Play taking joint responsibility for the brilliant Live Casino. But there are a few providers you might not be so used to seeing too, although they certainly deliver the goods – namely Wazdan and BF Games. The interface is fantastic. There is quite a lot going on but everything has its’ place, and the game categorization options are sensible and genuinely useful – including the ability to search by provider. It’s a handy filter for anyone who knows their software provider onions. You can also play demos of all of the games without needing to use up any real money, in case you’re keen to find out how they work. The black background makes the colours really pop, and it feels like an exciting place to play since the site has so much… well, energy. The games are available in HTML5 format, which is the way most decent companies are heading nowadays, so everything is instant play in the truest sense of the word – games load fast. There is a lovely mix between Slots, Table Games and a separate Live Casino section which really is the business. All in all you are looking at around 500 games that are easy to filter, quick to load and beautiful to look at. Slots – So many slots, so little time. Big Bad Wolf and Reactoonz are often trending, or try Novomatic’s new offering, Dusk til Dawn – just try not to swoon over George Clooney. Jackpots – A healthy choice of 20 Jackpots are ready to be won, and some of them are tasty. £12 million on Mega Moolah anybody? Live Casino – One of the best we’ve seen. 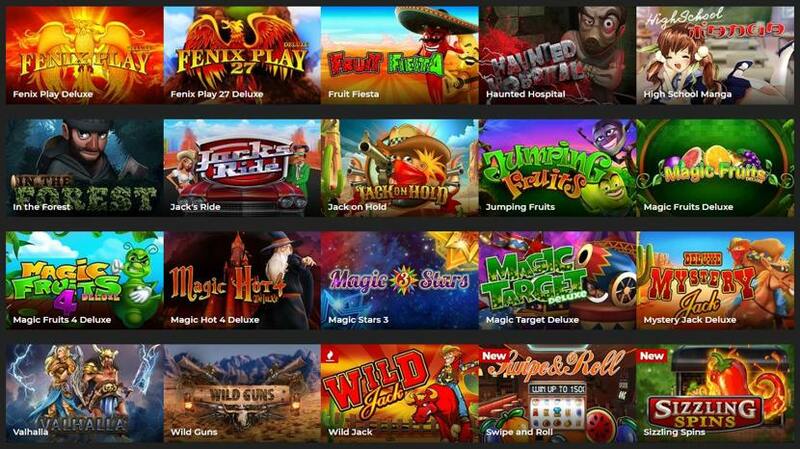 Evolution and Pragmatic Play join forces to provide more than 70 top quality interactive live games. Roulette, Blackjack, Baccarat and Poker players rejoice. Table Games – The 20 games on offer here include Red Dog, Oasis Poker, and of course plenty of Roulette and Blackjack variations. Tournaments – Make your spins win more by joining a Tournament. They come in all shapes and sizes and occur on a daily basis. As mentioned before, there is a mobile site available if that’s the sort of thing that tickles your fancy. The mobile site has been optimised to give you a similar experience to on the desktop, though, and some of you may prefer the look of that – it’s just as flashy. There is no app to go alongside but the small screen site does the job. It would be a lie to say that all of the same games you can play on the desktop are available on a mobile device, but plenty of them are. You can filter by slots, table games, poker or new additions to the casino, which will help you find the best game for you. You have all of the same great options found on the desktop site, and anything you can’t immediately find will be under the Menu button. In terms of functionality, the initial load might feel a little on the slow side but once it’s up and running the site moves fluidly and reacts quickly. Game loading times are respectable and they look great, although we did hit a ‘technical error’ once or twice. When it comes to your banking needs, Energy Casino have pretty much got you covered. The vast majority of traditional methods are available, so if you’re an old school user of debit and credit cards then you’ll be fine. Far more interesting is the amount of new methods that you can use to do your banking with. There are no regular fee’s as such, but be warned that you only get one free withdrawal per week. If you try and make another you will be charged £5 and if you try to withdraw money you have not wagered you will be charged 5% or a minimum of £10. Think on! Energy Casino gained its reputation early on by deciding to put profits in second place to customer satisfaction. It was set up by a group of people with a large amount of experience within the online casino community, so they had all learnt from their past and realised that applying the philosophy of ‘the customer is always right’ to an online casino would help them both attract and retain players. As mentioned in the introduction, Probe Investments Limited is the name of the parent company that operates Energy Casino. It was set-up in 2013 and added a sportsbook to its operations three years later. The company is based in Malta, offering an outlook in its gaming that is attractive to numerous European countries rather than just the United Kingdom. 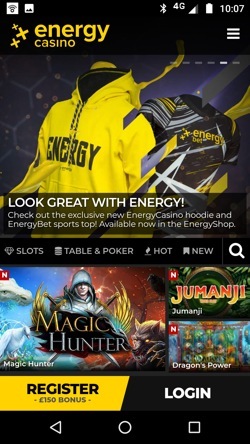 There are many elements that make Energy Casino attractive for the user, but the company’s continued focus on making the experience as enjoyable as possible is definitely up there. They also have an excellent balance of games, thanks in no small part to the variety of software providers that they use. There’s a pleasant mix of massive games from the likes of NetEnt and more personalised options from companies such as Merkur. 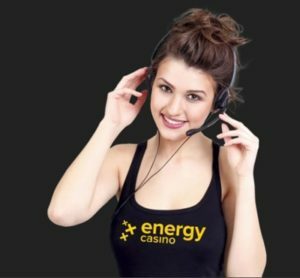 Energy Casino has operators that can be spoken to through Live Chat from 9am until midnight Monday to Friday, and then from 1pm until 9pm on a weekend. It’s not 24/7 but you won’t have to wait too long to get assistance if you should need it. E-mail response times are lightning fast too. There are two Help icons on every page, one at the bottom and one at the top, and info on all contact methods is held in the same place. It all feels very welcoming and as though they are happy to hear from their customers; like a manager with an open door policy. It’s a shame the casino doesn’t have a dedicated Twitter account as the Energybet one is highly effective – but you can’t have everything. Online forums and mediation sites speak highly of Energy Casino and their support team which is a big positive since bad news travels fast online. We can only back that up because in our experience the team have been responsive and helpful whenever we have needed them, if occasionally a little bit snippy. Live Chat – Most peoples favourite option. It’s easy to use and pops up in a separate window so you can get on with other things as you are chatting. Phone – There are three different phone numbers you can call, and we have no idea what the difference is, so try your luck with either: +356 994 5112; +44 203 608 6491; or +44 791 878 5604. @Energybet_com – Ok so this account is for the Sports betting side of things, but they are very responsive so might be worth a shot if you are desperate. The casino account was suspended, we wonder why..?